Found Turbo Rebuild Kit... Do I want to go there? It's not listed but when I e-mailed, I got information that according to their information, the SDL has a K24 and a rebuild kit is available for it (from them) that contains "seals and bearings" plus a few other "common wear" items. I'm positive I have a KKK and not a Garrett, but before I order the kit I'm going to remove the turbo and look for the model stamp just to be sure it's not something different like a K26. Here's the question - between my dad and me, if it's something that a reasonably competent home-garage mechanic can do, we can handle it provided the kit comes with instructions. But does anybody know from past experience that we're going to find something in there (a fitting that has to come apart that we won't be able to press back together ourselves, stuff like that) that would make it worthwhile to send it off for the rebuild instead of doing it ourselves? In a nutshell: based on experience, can reasonably competent people rebuild a triple-k turbo on the bench in the basement, or is this a job that even master mechanics prefer to send out? The primary problem with the turbo is the massive amount of oil it sends through the air intake, and in the process blows out all over the engine. This summer's project is taking care of these oil leaks and other things like that before I take it back to school this fall, so the turbo rebuild is happening one way or another regardless of whether the turbo is functional or nonfunctional as it is now. Question is... can we rebuild it? Theres nothing you cant do without regular hand tools and a few picks and such and alot of washers and such have to go in only one way. But ive only read DIY's i would suggest somone else who has done it to comment. 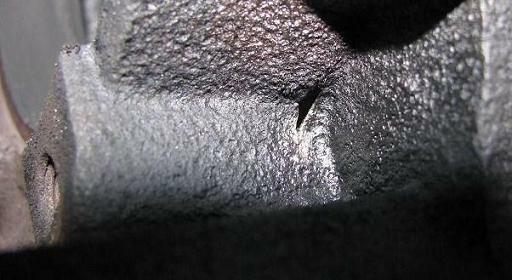 Are you sure the oil isn't coming from the valve cover vent into the turbo inlet hose? You can replace the parts that come with the kit but there's still the question of whether that will solve the problem. You won't know if some part that doesn't come with the kit (like the main shaft or center housing) is worn beyond its service limit. Some main shafts have left hand threaded nuts. Check the exposed threads before applying force. Well this is getting interesting... we got the turbo out today. Bit of a challenge leaving the exhaust manifold in but we finally wormed it out. To our surprise, we found a small hole (well, big enough to shoot wd-40 all the way through) burned in the cast housing. Will try to post a picture as a FYI tomorrow (Someone has my camera at the moment). It's more of a "crack" than a "hole" to be precise but it's large enough to put a wd-40 straw against (but not through) and shoot the spray into the housing through it. Any ideas what to do with it? The damage is right in an impossible corner, of course. Murphy. Option 1: maybe weld it? Option 2: Find a better housing in a junkyard? Option 3: Exchange for an already rebuilt unit and forget this one? 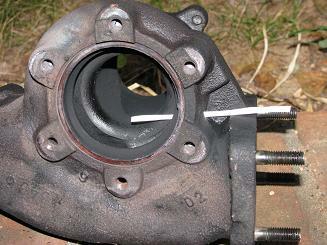 Do you mean the center housing, turbine housing, wastegate housing or exhaust flange? I say replace it. The trouble with defects you can see is they suggest bigger defects you can't see. Turbine housing we think but we're still trying to get the manual to load so we can be sure of what everything is called... it's definitely on the "hot" side. Here's two pictures. The white thing stuck through the damage spot is the twist-tie from a bread sack. I'll take a picture of the blades but I can't find a missing piece on any of the fans... I assumed since this was the hot side it was just the result of 200k+ miles of cooking the metal. It kind of does look like heat cycling fatigue, just check the impeller over really carefully if it looks good, then all you may need is a new housing.